Georgia DNR Capt. 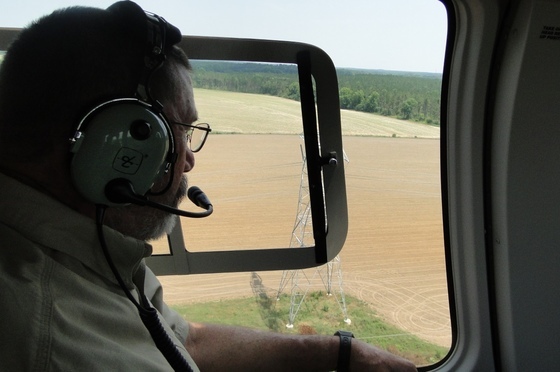 Steven Turner guides the helicopter along silver strands of high-voltage power lines. Goats panic and herons fly as the chopper thunders past. But senior wildlife biologist Nathan Klaus, riding shotgun, and technician Ashley Harrington are scanning the lines, towers and forest fringes for another animal: southeastern American kestrels. Klaus spots a flash of rust-colored feathers and fast-beating wings. “Got one – on this pole here,” he says as he marks the GPS coordinates. Harrington jots the sighting on a clipboard. 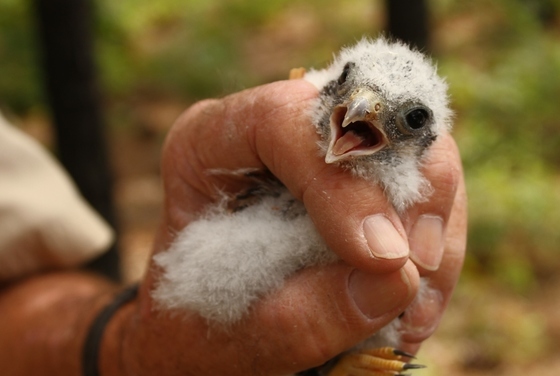 From a daylong aerial survey in May to banding nestlings this month, DNR is working to monitor the continent’s smallest falcon. The southeastern American kestrel, a subspecies found in Georgia from the Fall Line to the Florida line, is in decline. The culprit: habitat loss. Commonly called sparrow hawks, these raptors nest in cavities and forage in open forests, sandhills and grasslands, often hovering as they hunt. The loss of habitat includes power-line towers with hollow cross-arms where kestrels nest. As the aging poles are replaced with new ones that don’t have hollow arms, kestrels suffer. Power companies have pitched in by putting up nest boxes and supporting DNR-led conservation efforts (“Key for kestrels,” June 30). Yet Klaus is analyzing data from aerial and ground surveys, using computer models that weigh factors such as forest type, topography and soils to help determine where additional nest boxes will be most effective. The need is clear. Since this project began in 2007, Klaus has seen breeding populations in the Fall Line region plummet. Other populations, particularly along a transmission line from Albany to Pierce County, appear stable. 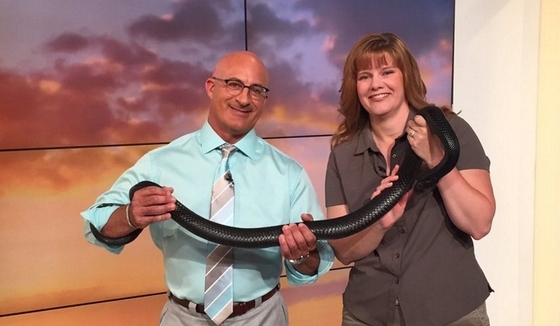 “This is really a species we need to keep an eye on,” he said. Watch as Nathan Klaus describes these unique birds. Buy or renew an eagle or hummingbird license plate. They cost only $25 more than a standard tag, yet sales and renewals provide more than half the revenue DNR’s Nongame Conservation Section raises each year. This part of the agency conserves kestrels and other wildlife not hunted or fished for, but depends largely on fundraisers. Upgrade to a wild plate and show your support! On the evening of May 13, 1864, Confederate troops camped along a shady slope near Resaca probably paid little attention to the plants flowering white and blue at their feet, like candles scattered across the forest floor. The soldiers were bracing for a Union attack. It broke at dawn the next day, the first major battle in the Atlanta campaign. The battle is history. But the population of large-flowed skullcap lives on. And because Resaca Battlefield is owned by DNR and managed by Gordon County, the federally threatened herb has more than a fighting chance where Civil War armies once raged. 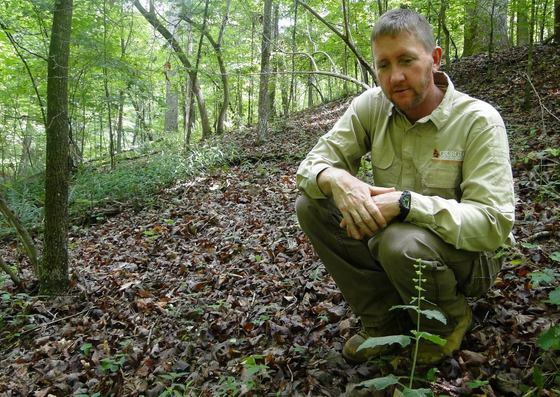 DNR technician Nate Thomas, who discovered the Resaca Battlefield population, said prime large-flowered skullcap sites in Georgia are ones with more than 100 plants. Resaca has 300-plus. “This is one of the state’s premiere sites,” Thomas said, adding that the county’s willingness to help conserve the plants strengthens that assessment. 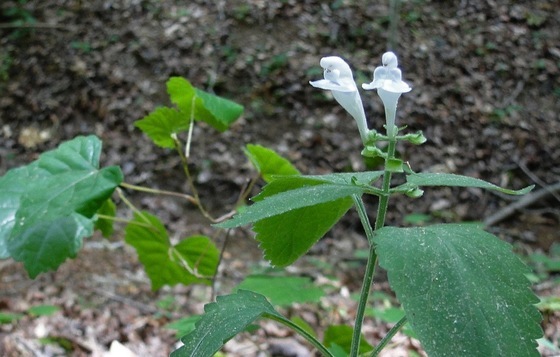 Even better, his surveys in the region have uncovered other large-flowered skullcap populations and promising partnerships, including with the Dalton-Whitfield Regional Solid Waste Authority. 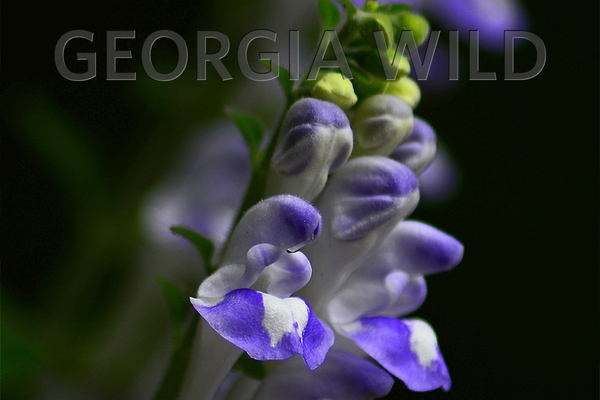 Read more about conserving large-flowered skullcap in this blog post. Found in the wild only in northwest Georgia and southeast Tennessee. Listed as threatened under the Endangered Species Act. Usually found growing on drainage slopes in mature hardwood or hardwood-pine forests with few shrubs. Threatened by logging, development and competition from invasive and native woody plants. Equipped with leaves that are, in Nate Thomas’ words, dog-ear soft, thanks to a covering of small hairs. From left, AntGuard (Terry W. Johnson), yellow jacket and fire ants. Now that we’ve celebrated Memorial Day, Georgia hummingbird enthusiasts know the time is drawing near when more hummingbirds will be visiting their feeders. They also know that more ants, yellow jackets, honeybees and wasps are coming, causing problems for hummers and humans. Read Terry’s column for tips, from homemade ant moats to commercial options. Bachman’s sparrows are back at Sprewell Bluff Wildlife Management Area, signs that prescribed fire and other restoration efforts are working at the Upson County site. The secretive sparrows – one of the big three of piney woods birds, along with northern bobwhites and red-cockaded woodpeckers – haven’t been documented at Sprewell Bluff in at least 10 years and possibly more than 50, said DNR senior wildlife biologist Nathan Klaus. But DNR’s Tripp Colter heard five males singing June 16, and Klaus recorded these birds Saturday. The species' return to Sprewell Bluff “really confirms we’re on the right path,” he said. More bird updates: During a recent survey, two golden-winged warblers – one more than last year – were singing on Brawley Mountain, site of a long-running habitat restoration project and the state’s last remaining population of golden-wings (“Good news for golden-wings,” May 28, 2015). Also, peregrine falcons nesting at Tallulah Gorge State Park are caring for their young, and drawing onlookers hoping to see these fast and fierce raptors. Enough island apple snails to almost fill a 32-gallon trash can were collected by volunteers in St. Marys Saturday. In a work day coordinated by the Coastal Georgia Cooperative Invasive Species Management Area, the group of more than 30 searched a pond at the St. Marys Aquatic Center for the invasive snails, which can reach about 6 inches in size. 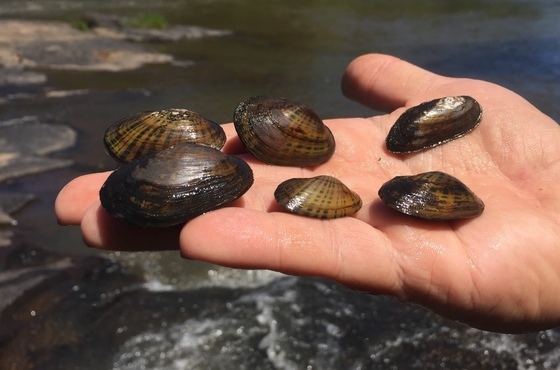 Native freshwater mollusks, such as these found last week on the Alcovy River near Covington, are being surveyed across the state. Included are long-term mark-recapture studies of mussels, research that helps DNR and other biologists assess mussel populations and better understand these key indicators of water quality and their relationship with their environment. 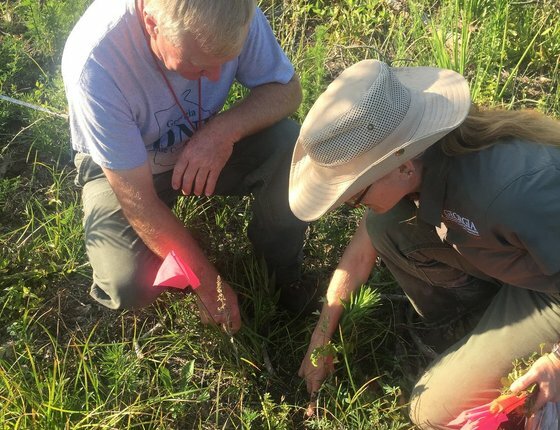 Hundreds of Georgia pinewoods milkweed and pitcherplants were planted at a handful of Georgia state parks last month to boost native pollinator and carnivorous plant habitats being restored through the Interagency Burn Team's work. The plants were grown from locally collected seed: the milkweeds by Atlanta Botanical Garden, the pitcherplants by Georgia Native Plant Society volunteer Amy Heidt. Partners also included the U.S. Fish and Wildlife Service, which provided funding, and Abraham Baldwin Agricultural College, steward of a pitcherplant bog used as a seed source. Read the Fitzgerald Herald-Leader's coverage. “Rescuing” an animal can sometimes cause more harm than good, even if done with the best of intentions. This is often the case when people come in contact with seemingly orphaned young wildlife. Guidance on what to do. The bald eagle nest livestreamed by Berry College is empty again. But here’s the school's look back at the “Year of B6 and B7,” the two eagles that hatched and fledged as scores of fans watched this spring. It’s not too late to join the Discover the Forest nature photo challenge. Search #GetOutdoors16 on Instagram to find rules and photos, all part of a campaign aimed at helping people explore forests near them. 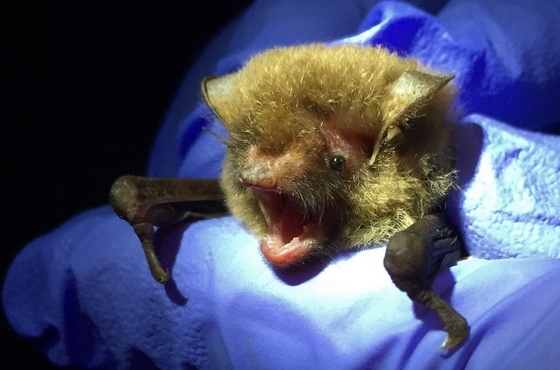 This female Southeastern myotis was caught and released recently during DNR monitoring at a southwest Georgia cave. Although in Georgia these bats are found only in the state’s southern part, the species is considered at risk of white-nose syndrome, the disease that has ravaged bat populations in north Georgia and beyond (“Local, global fallout growing,” May 17). Names in the news: Nongame Conservation Section Chief Dr. Jon Ambrose has been elected incoming vice chair of the South Atlantic Landscape Conservation Cooperative. New steering committee officers also include Chair Rick Durbrow, of the U.S. Environmental Protection Agency. Landscape conservation cooperatives are self-directed partnerships between federal agencies, states, tribes, nonprofits, regional organizations, universities and other entities dedicated to achieving landscapes capable of sustaining natural and cultural resources. The South Atlantic cooperative spans parts of six states from Virginia to north Florida. -- Shadowing manatees by satellite. -- North Georgia school helps with hellbender study. -- Strong spring for rare woodpeckers at Silver Lake. Checking the progress of prairie restoration at Oaky Woods, DNR botanist Lisa Kruse and technician Hal Massie monitor vegetation at timber harvest areas on the wildlife management area near Perry. Blackland, or chalk, prairies, are globally imperiled and a high-priority habitat in Georgia’s State Wildlife Action Plan. These unique communities feature species found nowhere else in Georgia, such as limestone bedstraw and Drummond’s skullcap. The recent checks done by Kruse, Massie and intern Emily Ferrall will help determine whether the species composition is being restored in restoration areas, compared to intact prairies at Oaky Woods. DNR botanist Tom Patrick talks chalk prairies in this 2011 video.